My novella, Maya, Resurrected, was published by Wolfsinger Publications in 2016. It is available in paperback and ebook from Amazon.com, createspace.com and smashwords.com among other places. This post is more commentary and personal reflection than review. Are you really in your body at all? Why is this important? These are questions that have been rolling around in my mind for a very long time. Having been an intellectual kid, a daydreamer and a bookworm, I lived in my head, hardly aware I had a body at all. Luckily I found yoga while I was still in high school and began discovering what it was like to inhabit this body and to have a physical relationship with the world around me. When I started learning to play the guitar at age twenty-five, the questions became even more intriguing because of the necessary physical dexterity of playing the instrument, which did not come easily. Twenty years later and I’m more obsessed with guitar playing than ever, and it has much to do with the physicality of the art in contrast with writing, something that I’ve been doing for so long, I can’t remember what it was like to learn how. Last year, in the midst of my disaffection with writing fiction, I decided I would write about guitar playing. The crux of this book is that the guitar is a place, an object that by playing it, anchors the player in reality. This revelation swept me, I think, sometime last summer. When i gave this piece to my husband to read last fall, he said, "You should carry this around with you, and when people ask you what you do, hand it to them." These sorts of questions could only be asked by someone who does not play guitar, because the answer for “Bob’s” continued popularity is that he was a great—even fascinating—musician. Why is the fact his records didn’t sell much to his black contemporaries even relevant? Audiences are notoriously poor judges of good musicianship, of art in general, preferring novelty over quality. What’s popular is often not what survives or what is appreciated by later generations. Some art is of the moment. Some is timeless. You find out what is timeless only after time has passed. Add to this that Robert Johnson made only a few records and died shortly after making them. Those records were recorded near the end of guitar blues’ popularity. They may have sounded passé to ears who’d been listening to guitar blues on records for a decade or more, but to the fresh ears of those who came thirty years later, Robert Johnson’s blues is revelatory. Where’s the surprise in that? He may not have been a great innovator of the blues, or even particularly original, but his mastery of the form is undeniable. His music is a perfect synthesis of his influences. For anyone unfamiliar with his influences, it can’t help but hit like a tidal wave. My mother was not intentionally treacherous. She intended to love me, but nothing was ever that simple for her. I’ve no doubt my mother had passionate emotions about me, worried over and even doted on me on occasion. She called the intense feeling she had for me “love.” But somehow she was able to put this feeling aside in order to do exactly as she pleased. She did not “love” me. Loving involves action. It is not an emotion. This misconception causes more pain and suffering in the world than any other. The act of loving someone may bring you exaltation or it may sink you in despair. Neither emotion is a stand in for the act of love itself. They are the products that have so unfortunately become bound to the word “love,” which is a verb. You cannot “have” love for someone, anymore than you can have “swimming.” You give it or you cannot rightfully lay claim to it. You love and you are loved. That is all. My mother needed to demonstrate her “love” in grand fashion, and her grandest demonstration was a blowout celebration of my menarche, an event she’d not been present for, having been away filming a movie in Australia. (It was her first and last turn as an actress, her life notwithstanding. Neither the Oscar nor the Golden Globe was forthcoming; she wasn’t going to waste anymore time on that.) She was either several years late or I was a late bloomer, sixteen, when we packed up the station wagon—we were traveling in cognito, just “we two gals”—and headed southwest toward the shawoman camp in New Mexico. My mother laughed with genuine glee. I could do that sometimes – make my mother laugh. She laughed easily. It was me who had lost interest. I had once cherished that ability to elicit it – her laugh – but I lost interest when I realized how fickle it was. One minute she was laughing for me and the next it was for someone else. I don’t even know if she missed my sense of humor, such as it was. I wish I could get it back. 859 A.D. Yohl Ik’nal (“Heart of the Wind Place”) is alone with her two starving children on their drought-stricken farm. Her husband and two grown sons have been drafted to fight in a distant war. Will they ever return? Yohl can’t afford to wait. Her hungry children must be fed. It’s time to dig up Yohl’s past, for her mother was a princess, her grandfather a king. She still has relatives amongst the Maya royalty. They are her best hope for salvation. Follow Yohl and her children as they travel Maya causeways, highways of the ancient world, through ravaged jungle and depressed homesteads to the capital city, itself on the verge of economic collapse. Can the religious spectacle of human sacrifice provoke the Gods’ beneficence? If the Maya ceremonies and myths fail, Yohl has recourse to the older, deeper traditions of the forest people. She’ll do whatever necessary to survive. Both of these discounts are good through 1/31/16. 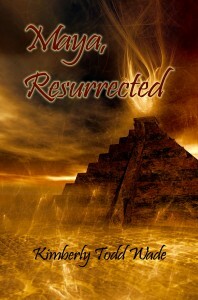 Maya, Resurrected will also be available on Amazon and other on-line retailers. You can bet i'll let you know when. This is from a question and answer period following a lecture given in 1978. Hopefully we all know the truth of this by now, and yet "science fiction" is still segregated from "literature." I was further struck by the quote because Jaynes' theories have been an enduring source of inspiration for my work--as an artist. In the hairiest parts of the creative process, it can be hard not to give into frustration or boredom. Part of being an artist is building up a tolerance for difficult states of mind. I wrote the beginning of a novel a little over a year ago and promptly put it away. I wasn't interested in writing another novel. Recently i fished it out and typed it up. Maybe. Edits and payment for Maya, Resurrected arrived last night. I haven't looked at this manuscript in five years, but--YAY!